No more bending or kneeling to bathe your child. 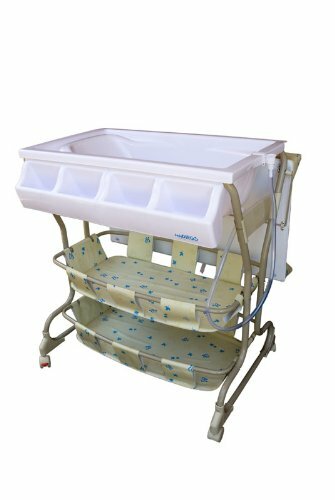 Primo's Folding Bath Stand helps make bathing a baby easier and more convenient. 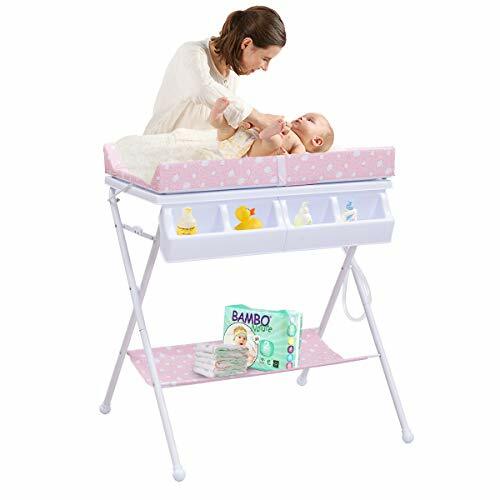 The Primo Folding Bath Stand has been designed to work only with Primo EuroBath and Primo Ducky Bath. 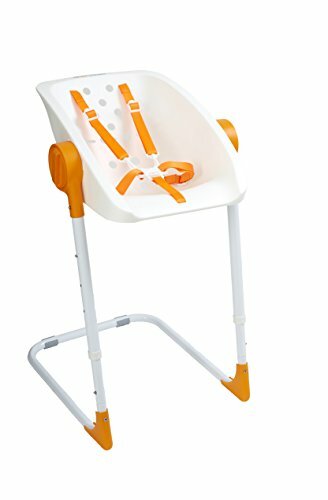 Safe for use with babies 0-12 months (or up to 30pounds) who cannot stand up unassisted. 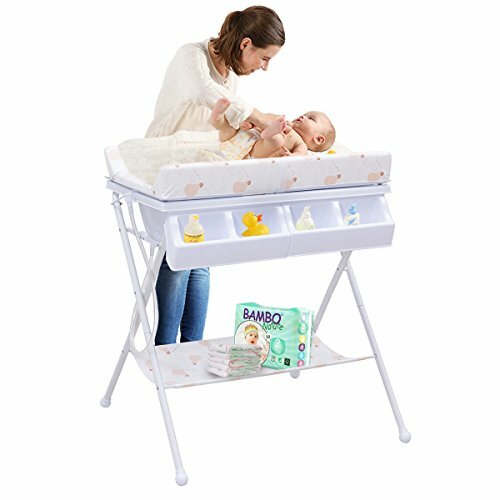 The stand puts the baby bath at waist height to help stop Mom's back aches and pains from kneeling or bending during bath time. Primo's Bath Stand comes equipped with an easy to clean vinyl fabric shelf. The shelf conveniently holds soaps, bath toys and towels for use during bath time. 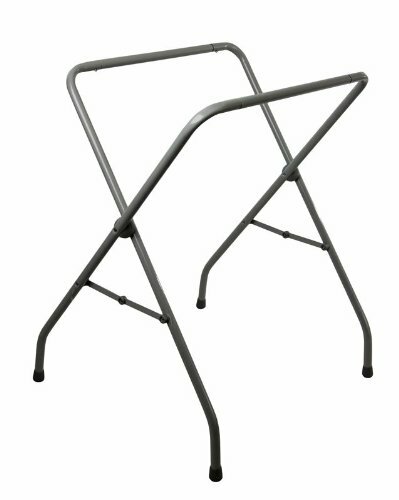 A sturdy steel frame and skid-proof floor bumpers also give the Primo Bath Stand stability to prevent movement of the stand. The Primo Bath Stand is compact and easy to store. The stand can either be folded for short term storage or easily disassembled for more compact long term storag. Exclusively designed for the Dream On Me, Baby Batherer Bath Tub Stand elevates the 2 Position Baby Bather Bath Tub allowing parents the convenience of bathing their baby without having to lean over a standard bath tub or kitchen sink. Rubber tipped feet ensure the stand stays secure and also prevents scratches on your floor. An easy compact fold for storage makes this metal stand a necessity. No assembly required, sold separately from the Dream On Me 2 Position Baby Bather Bath Tub. 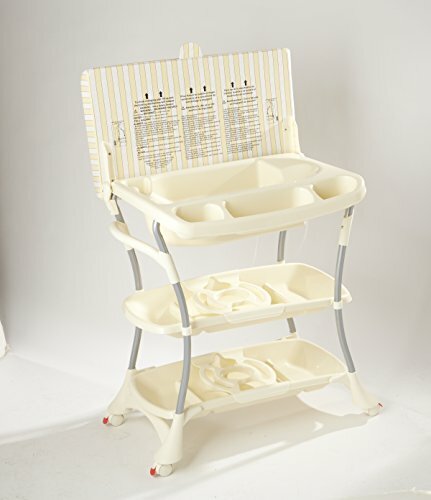 Primo's EuroSpa Bath And Changing Center offers a complete baby bath tub, changing pad and a bath stand in one unit. Pamper your baby & yourself (especially your back). No more bending over to bathe your baby in the tub. No more taking baby into the kitchen sink. This wheeled bathinette offers parents the comfort and practicality of an elevated bathing and changing station that can be used anywhere in your house. It is designed for babies from newborn to 18 months (up to 30 pounds). The EuroSpa's baby bath is designed with 2 positions to comfortably allow an infant to recline or a toddler to sit up while bathing. A contoured baby stopper molded into bath helps to position the baby in the bath. Simply fill the bath with a cup or water sprayer. A long drain tube allows the bath to be easily drained without lifting the bath. All of your bathing supplies are within quick access in the side compartment accessory tray. This high-quality baby bathing table could also be used as a changing table. 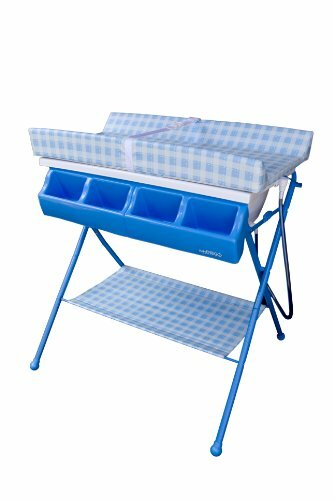 The standard bathing table makes life easier for parents. It offers the comfort and practicality of an elevated bathing and changing station. No more bending to bathe baby in the tub. The lower storage space could be used to keep toys, diapers and bathing supplies. The four compartments could be used to place soaps, towels and so on. The changing pad includes a safety strap and is made of soft non-toxic cushioned PVC, which is great for baby diaper emergencies as the pad can be easily wiped clean. The stylish stand is foldable for easy storage. If this happens to be what you are looking for, don't hesitate to buy it! Baby Diego's standard bathinette makes life a little easier for parents. It offers the comfort and practicality of an elevated bathing and changing station. No more bending to bathe baby in the tub. Caddy compartments and lower storage space keep towels, toys, diapers and bathing supplies neatly organized. 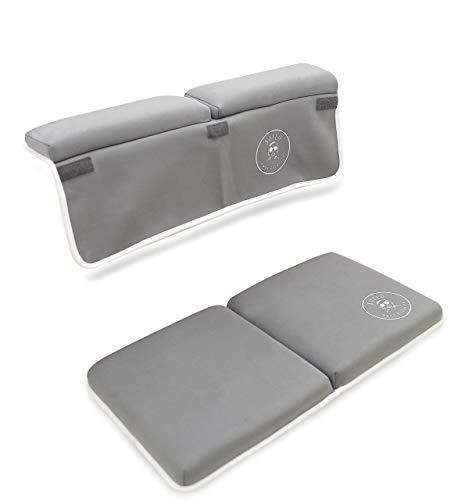 The changing pad includes a safety strap and is made of soft non toxic cushioned vinyl, great for baby diaper emergencies as the pad can be easily wiped clean. 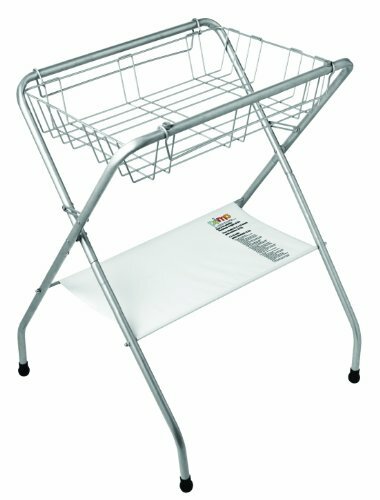 The stylish stand allows for it to be folded and stored if necessary. Baby Diego's deluxe bathinette offers parents the comfort and practicality of a wheeled bathing and changing station at waist level. Roll bathinette into the most convenient location to bathe your baby. The changing pad includes a safety strap and is made of soft non toxic cushioned vinyl and can be easily wiped clean. Two large storage trays and caddy compartments keep towels, toys, diapers and bathing supplies neatly organized and within easy reach. Help keep your baby clean and comfortable from a tiny newborn to an active toddler in the Safety 1st Newborn to Toddler Bathtub. With features that help make bath time easier through different stages, you'll love the confidence this tub gives you when bathing your child. The SlideGuard mat and contoured sides help keep your baby steady. The specially contoured design is also great for toddlers, giving them the support they need to sit upright. 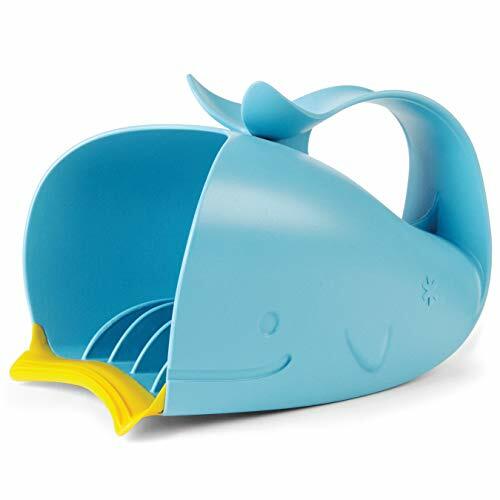 Through both stages, the molded hook allows for easy drying when bath time is done. This Newborn to Toddler Bathtub can be used in standard size single or double sinks making it great for a variety of homes. As baby graduates from sink to tub and has learned to sit-up, the Hug Tub is there to help with this transition. This versatile little bather hugs baby with all-around comfort. The U-shaped design wraps around sitting baby. There is even a little drop-down soft seat with non-slip padding on underside. When it's time for shampooing, baby can recline back with head elevated. Baby can even enjoy some tummy time in this bather while you clean their backside. 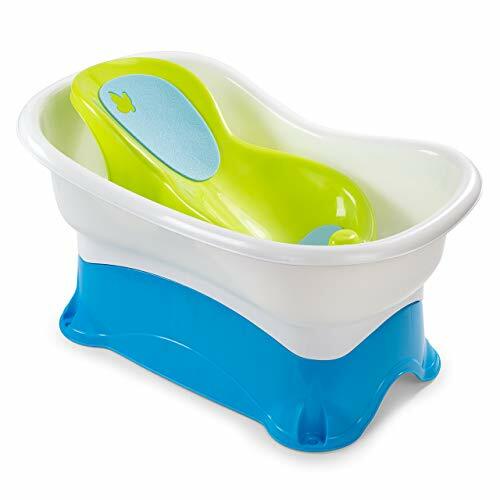 The Dream on Me 2-Position Baby Bather Bath Tub features a unique shape and design for bathing infants through 24 months. 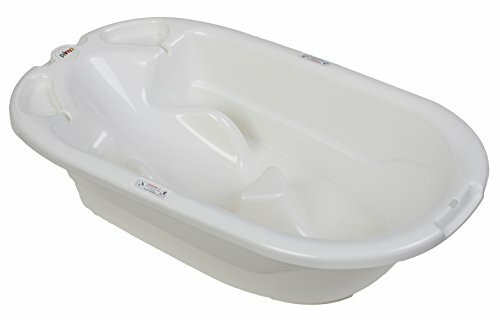 One end of this tub has a reclining position for infant's comfort that are unable to sit up on their own. Their legs straddle the raised surface in the center of the tub to help prevent them from sliding. This allows mom ease in bathing her baby. The opposite end of this tub is designed for when the baby has a sense of balance to sit up on its own, assisting in a more comfortable, ideal position for your growing child and making bath time safe, fun and convenient. Infantino Whale Bubble Ball. Have a ball in a soft, supportive whale tub that turns into a splashy ball pit with 10 floating balls and a jingling tail. Deflates and folds easily. Includes 10 floating balls. Features:Color: Pink, GreenMaterial: PP (Polypropylene) + PolyesterSize: Approx. 57 x 31 x 30cm/22.44 x 12.20 x 11.81Package Included:1 x Baby Bath Support Seat Chair1 x User ManualSoft mesh slingMachine washable fabricDeluxe cushioned head rest3-position backrest reclineSolid baseRemovable, washable fabric seatSuitable from babies from birth until they can sit up without assistanceThe Deluxe Baby Bather cradles newborns, making bath time easier and safer. The bather now boasts a 3 position recline, helping baby to feel comfortable throughout their stages of growth and development. The soft mesh, head support and solid base gives newborns the extra support and security they need, making bath time easier for parents and enjoyable for babies. The integral head support cushion dries easily and provides additional support. The removable fabric seat is quick drying, mildew resistant and machine washable. "1.cotton 2.Material: 100% Cotton, comfortable,do the massage for your baby. 3.Size: 58 * 67cm , Grows with your child from newborn to toddler 4.Hammock type design prevents the danger of swallowing the water for baby. 5.Padded pillow for extra support and comfort when bathing. 6.Premium quality fixed button for added safety,also easy to install.Suitable for ages 1-3 years,baby's weight within 20kg/44kg."